This event begins with all six teammates on the starting mat. At the sound of the beep, the male/male pair will move forward to the Assault AirBike, where one athlete at a time will complete 20 calories. The pair will then move to the rig to complete 50 synchronized wall-ball shots, then to the pull-up bar for 20 synchronized bar muscle-ups. They will then move to the rower, where one athlete at a time will complete 20 calories. The first athlete to complete the row will move to the chess piece and wait for his partner. Once both athletes have reached the chess piece, the next pair will enter and begin biking as the first pair moves the chess piece forward and then moves to the finish mat. The female/female pair will proceed through the stations in the same fashion as the first pair, performing 15 calories each on the Assault AirBike, 50 synchronized wall-ball shots, 20 synchronized bar muscle-ups and 15 calories each on the rower. Once the rows are complete, they will advance to the chess piece to release the final male/female pair and move the chess piece forward. They will then advance to the finish. The male/female pair will proceed through the stations in the same fashion as the others. 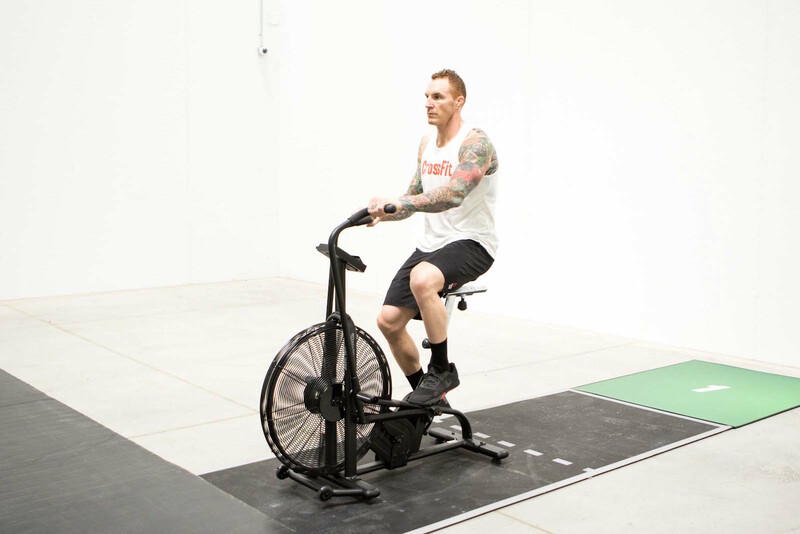 The male athlete will perform 20 calories on the Assault AirBike, and the female athlete will perform 15 calories. They then will complete 50 synchronized wall-ball shots, 20 synchronized bar muscle-ups, and then 20 and 15 calories respectively on the rower. Once the last row is complete, they will advance to the chess piece, then to the finish mat. 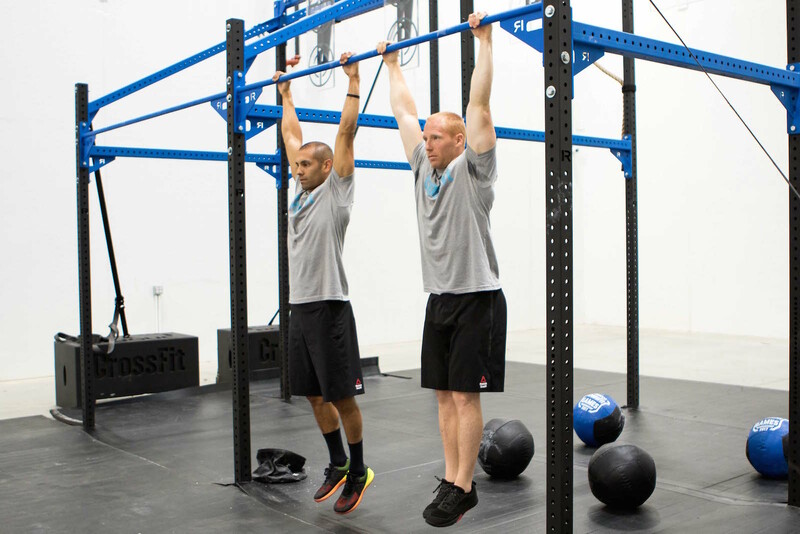 The minimum work requirement for this event is 1 bar muscle-up by the FF pair. Full video of Team Event 3 can be seen here. The monitor on the bike will be set to zero, and the athlete must reach 30 calories before moving off the equipment. The athlete can adjust the seat at any time but may not touch the monitor. 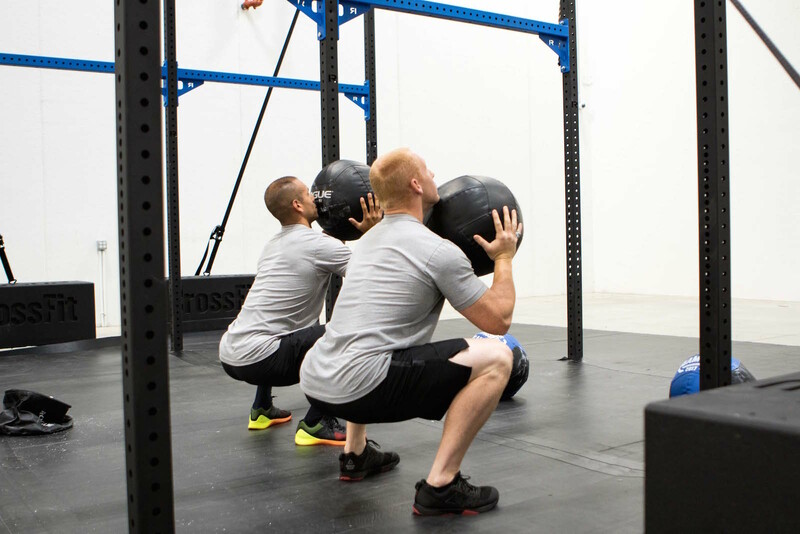 In the wall-ball shot, the medicine ball must be taken from the bottom of a squat, hip crease below the knee, and thrown to hit the target. Both athletes must be in the bottom position of the squat at the same time before standing to throw the ball. The ball must hit the face of the target. Both balls are not required to hit the target at the same time. If either ball hits the bottom or the side of the target, it is a “no rep.” If the ball drops to the ground from the top, it cannot be caught off the bounce to begin the next rep. The ball must settle on the ground before being picked up for the next rep. In the bar muscle-up, the athletes must begin with, or pass through, a hang below the bar, with arms fully extended and the feet off the ground. Kipping the muscle-up is acceptable, but pull-overs, rolls to support and glide kips are not permitted. The heels may not rise above the height of the bar during the kip. At the top, the elbows must be fully locked out while the athlete supports their body above the bar with the shoulders over or in front of the bar. Athletes must pass through some portion of a dip to lockout over the bar. 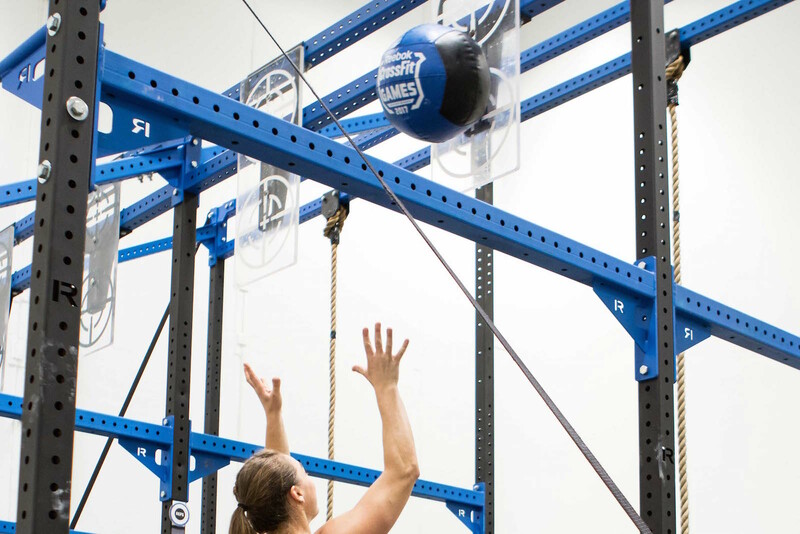 Only the hands, and no other part of the arm, may touch the pull-up bar to assist the athlete in completing the rep. Both athletes must hold the top position at the same time for the rep to count. 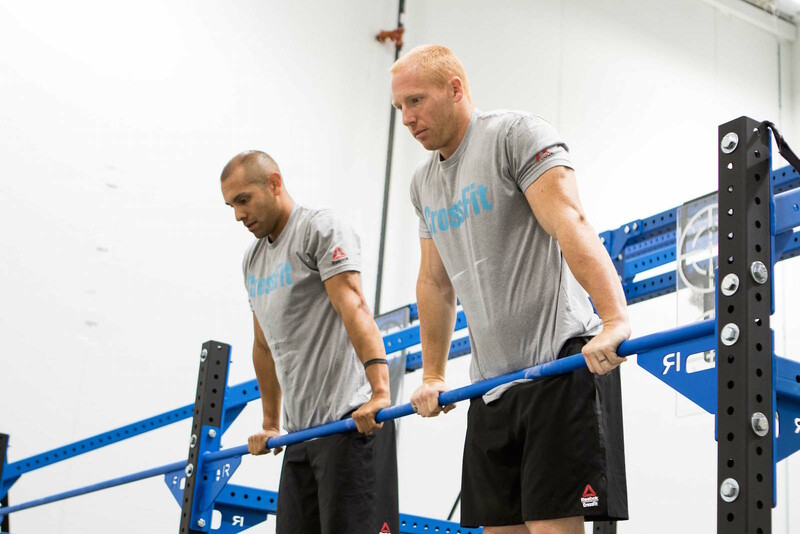 Partners may assist each other in jumping up to the bar at the beginning of a rep. The monitor on the rower will be set to zero before each pair starts. 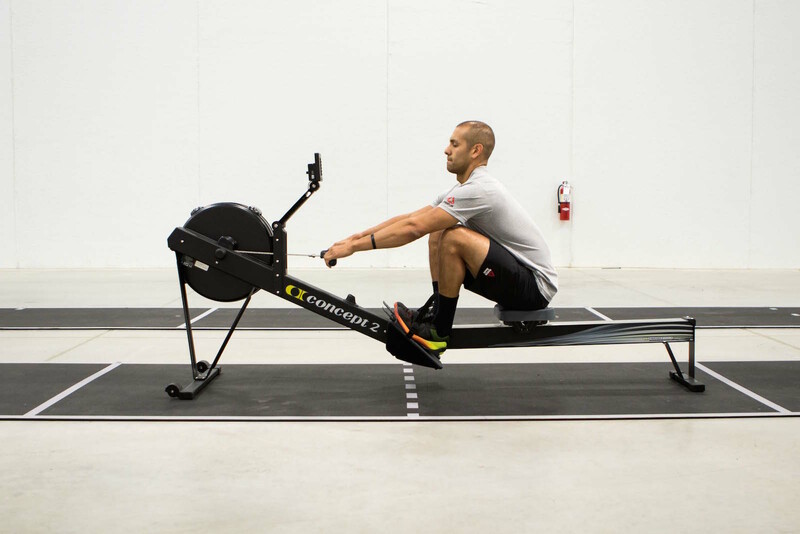 The first athlete must stay seated on the rower until their required calories are complete. Without resetting the monitor, the second athlete will row until the sum of the pair’s required calories are complete (40 for the MM pair, 30 for the FF pair, 35 for the MF pair). Athletes may adjust the damper and foot settings at any time but may not touch the monitor.